There are two ways to participate in a Single Session Therapy meeting. 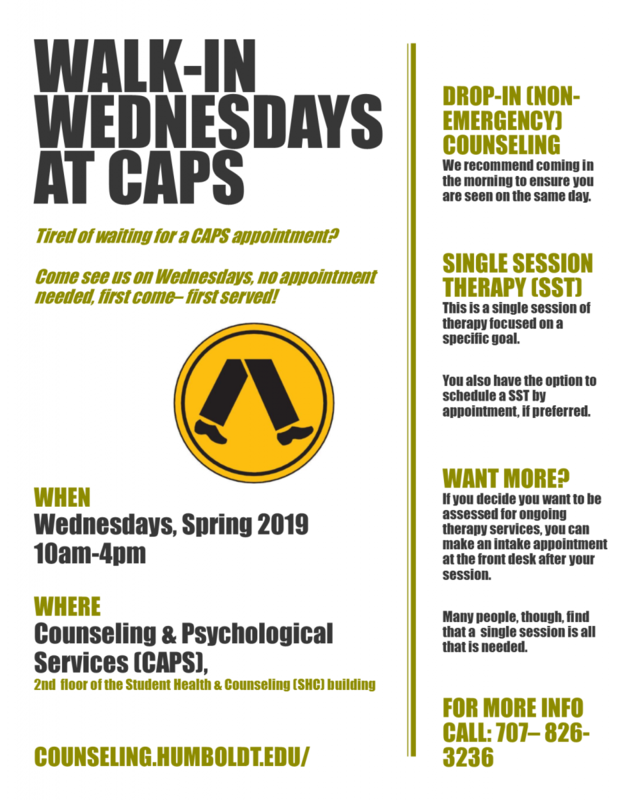 You can either schedule such a session or you can show up for our "Walk-in Wednesdays" program (which offers drop-in SST sessions on a first come-first served basis). Who might benefit from a SST meeting? The assumption behind all short-term therapy is that people have the capacity to change their thoughts, emotions, and behaviors in a way that creates significant and meaningful changes in their lives. With focused work, SST can help you make changes that can cause "a positive cascade of ripple effects" (see Hoyt et al. , Single Session Therapy by Walk-In or Appointment). Just about anyone that is able to get clarity on a specific goal and that is able to stay focused can benefit from SST. How does it work? You can choose to come on a Wednesday on a drop-in basis (come in the morning to assure a spot for that day!) or you can schedule the appointment up to 48 hours in advance. We have kept "paperwork" to a minimum. It should take you no longer than 15 minutes to complete some brief forms. You will meet with the counselor for 50 minutes and the two of you will focus on what YOU want to focus on. The therapist will help you to clarify your goal/s (while keeping them manageable) and will work hard to help you get a handle on things. S/he may provide education, teach you particular skills, provide tools, help you develop more insight and/or shift your thinking, and may also suggest resources or steps for the future.